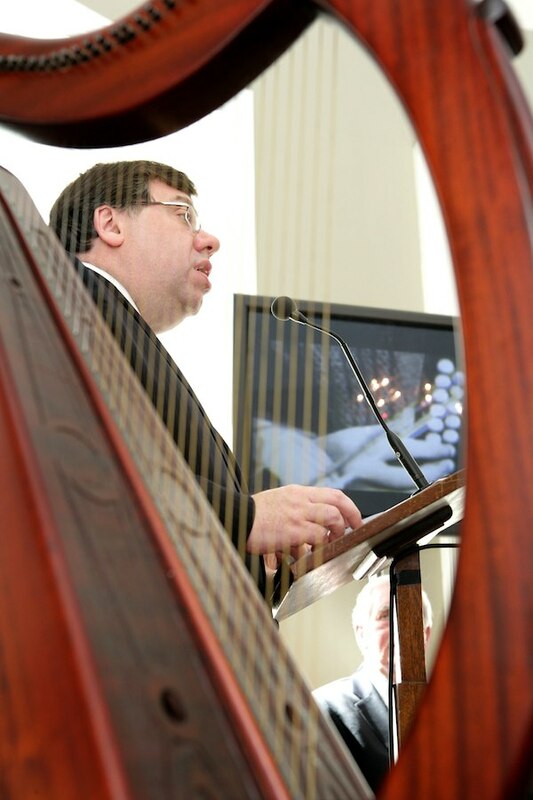 We’re delighted to announce that the Comhaltas Archive was launched on Wednesday, 21 April by the Taoiseach of Ireland, Brian Cowen. Please come and browse through some of the treasures of Irish Traditional Music and Song! Ba mhaith liom ar dtús buíochas ó chroí a ghlacadh le Comhaltas Ceoltóirí Éireann as ucht cuireadh a thabhairt dom anseo tráthnóna chun ‘Cartlann Dhigiteach Chomhaltas Ceoltóirí Éireann’ a sheoladh go hoifigiúil. Is ócáid fhíor-speisialta í seo, ní amháin dár n-oidhreacht ach dar bhféiniúlacht náisiúnta chomh maith. Is cuid lárnach dár gcultúr an ceol, na hamhráin agus na scéalta atá bailithe le chéile sa chartlann iontach seo. Sa lá ata inniu ann agus an úsáid atá a bhaint as aiseanna nua aimsire tá tograí mar seo ríthábhachtach. Tugann sé deis do na mílte sa tír seo agus ar fud an domhain gurb suim leo ár n-oidhreacht, teacht ar foinse ceol, amhráin agus scéalta Gealach in aon áit amháin. Anois Tá an dúchas agus an nua-aois pósta le chéile, agus is cleamhnas iontach é.
Tá céim mór eile atá a thógáil againn inniu i stair iontach Chomhaltas Ceoltóirí Éireann agus an obair atá déanta acu ag caomhnú an t-oidhreacht saibhir cultúr atá againn sa Tír seo. Tá ard mholadh tuillte ag Ard-Stiúrthóir Chomhaltas Ceoltóirí Éireann, an Seanadóir Labhrás Ó Murchú, agus baill an Chomhaltais as an sár obair atá déanta acu lena chinntiú go bhfuil fáil againn anois ar an Cartlann iontach seo. Chuala mé go bhfuil éileamh mór ar an Cartlann nua seo hanna féin, is cinnte gurb ag fás a bheas an t-éileamh sin. Today we open a major new chapter in the preservation of Ireland’s rich cultural heritage. It is a pleasure to be here with you in the National Gallery of Ireland to launch Comhaltas Ceoltóirí Éireann’s Digital Traditional Music Archive. This very welcome initiative testifies to the organisation’s steadfast commitment to the preservation and promotion of Irish traditional music, song, dance and language. Connecting people through time and across continents, introducing old tunes to new players, illuminating regional styles and bringing generations together, the digital Comhaltas Archive honours Ireland’s priceless cultural legacy and bestows it intact on us and future generations. Ard - Stiúrthóir, Senator Labhrás Ó Murchú and Comhaltas are to be commended for developing this important cultural project: you have done this country a real service. The new archive links together the local collections of the Comhaltas Regional Resource Centres with the national collection at Cultúrlann na hÉireann; and makes it possible for people around the world both to experience and to contribute to the Comhaltas collection. It has been widely acclaimed at home and abroad - from as far away as Argentina and New Zealand. During his tenure as Comhaltas’ Timire Cheoil, Séamus MacMáthuna made original field recordings of some of the most significant Irish musicians, ensuring the smooth passage of tunes and songs and stories from one generation to the next. These stories and tunes are now a part of local and family history - part of the very fabric of each region. Preserving these sounds on magnetic tape opened the door for the next musicians to peer in, listen and experience Irish culture in its purest form. Johnny Doherty, Bobby Casey, Leo Rowsome, Patrick Kelly, Denis Murphy, Willie Clancy - all immortal names living on through the shared memory of the Comhaltas Archive. Now that the Archive has gone digital, musicians from all over the world will be able to draw inspiration from these iconic musicians and others like them. The initial release of the Archive system includes 15,000 audio items and 4,000 photographs but this is a living collection, growing and evolving with new material every day. The ongoing work of cataloguing, digitising and indexing will add new material and I understand that Comhaltas is making a renewed push to identify collectors who would like to share their treasures with the world through the Comhaltas Archive - and that many private collections have now been donated. The Archive Project is part of the Development Programme of Comhaltas which is being funded by the Government and has helped establish 16 cultural centres covering the whole island and providing cultural and tourism services to their dedicated regions. Comhaltas has really flourished since its foundation in the early 1950s. Today, it provides services to 3 million people each year and has over 400 branches in 15 countries on 4 continents. And it is now possible to view the extensive cultural programme of Comhaltas on a new website www.comhaltas.ie . The website is totally bi-lingual and I am pleased to hear that it has already had over 18 million hits. Déanfaidh an Chartlann seo deimhin de go dtiocfaidh an saibhreas cultúrtha na Tíre seo slán do na glúinte atá le teacht ní amháin sa tír seo ach ar fud an domhain. Déanfaidh sé cinnte freisin go mairfidh an cultúr sin beo. Cuireann sé lúcháir orm ‘Cartlann Dhigiteach Chomhaltas Ceoltóirí Éireann’ a sheoladh go hoifigiúil. Go raibh míle maith agaibh go léir.